Jimmy Fallon’s “Ew!” sketches on The Tonight Show have become wildly popular. This week, the late night host teamed up with pop singer Ariana Grande for his latest “Ew!” sketch. You have to check it out. There’s something startling about seeing Ariana Grande back in the rainbow-colored clothing that dominated her years on Nickelodeon. 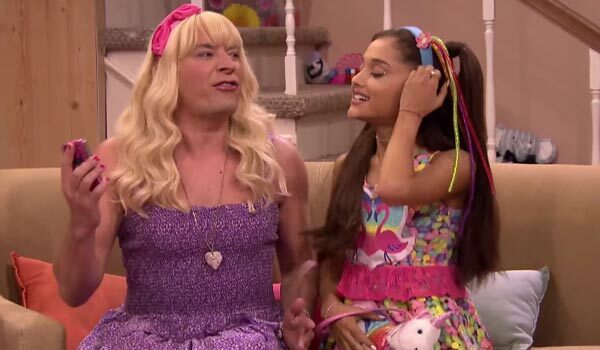 In the video, Fallon has on his signature purple dress and braces, while Grande looks as if she’s been vomited out of a Lisa Franklin catalog. The two chat about “Insta” pics before taking a selfie and having a sing-off. Typically, Fallon’s a pretty solid singer, but he affects a ridiculous accent during these sketches, and it’s even present in his vocals. Grande’s character is a little more concerned about showing off her voice, but of course crushes it when she is pushed by Fallon’s Sara character. There’s even a “Grande” joke thrown in when the singer says calls a Starbucks Venti latte “Ew!” Naturally, she prefers Grande. While the “Ew!” sketches are all parody, it’s still a bit of a blast to the past to see Ariana Grande hearkening back to her days on Victorious and Sam & Cat with the brightly-colored clothing and the teeny bopper persona. Nowadays, the singer is busy blowing up on the Billboard charts. In 2014, she produced “Problem” and “Break Free,” not to mention guest starred on Jessie J’s huge summer single “Bang Bang.” She’s now making waves for her huge vocals rather than her acting ability and her onstage presence is certainly a different, more mature look for the celebrity. However, since she has an acting and a singing background, she’s the perfect fit for an “Ew!” sketch, which incorporates both. Another “Ew!” sketch in recent memory featured will.i.am popping up as “mir.i.am” to create a music video for The Tonight Show. And Taylor Swift, Zac Efron and Seth Rogen have all appeared in “Ew!” videos before. It’s refreshing to see celebrities dressing up and acting a little silly on late night TV, but we shouldn’t expect anything less from Fallon, who is the master at making celebrities comfortable on the late night stage.